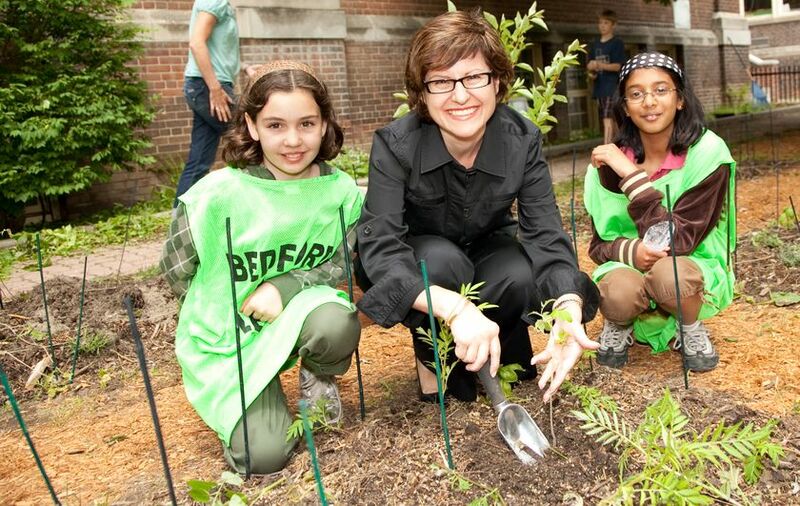 TORONTO (June 9, 2008) – Students across the country are studying outside these days as Canadian schools initiate school ground greening projects, or, outdoor classrooms. Helping schools get shovels in the dirt is Toyota Evergreen Learning Grounds, a national program that brings school communities together to transform barren school grounds into healthy, natural and creative outdoor classrooms. In Toronto, Bedford Park Public School is one example of over 1,500 Canadian schools the Toyota Evergreen Learning Grounds program helped transform since 1993. In 2000, Toyota Canada Inc. partnered with Evergreen, a not-for-profit organization that makes cities more livable. On June 9, representatives from Toyota Canada Inc., title sponsor of the Learning Grounds program, visited Bedford Park to celebrate the project’s longevity and contribution to a greener learning experience for its students. Classes throughout the day planted herbs, flowers and some vegetables with older students from the school’s environment club, Eco Kids Squad. Toyota Canada and local Dealership, Toyota on the Park, joined students and teachers to plant seedlings in the garden beds. Greening projects range from planting trees for shaded study areas, habitat creation or restoration for observation and learning, as well as food, flower and herb gardens. The overarching goal is to create hands-on opportunities for students to investigate nature’s complexity and learn from it. Bedford Park’s greening project includes dozens of shade trees, 21 4x4 foot garden beds and several natural areas on the school grounds. Teachers use the garden beds to animate the living systems strand of science curriculum. Students plant and harvest herbs and some vegetables for four years running. Ranleigh Rascals Daycare, which shares the school grounds, helps water the gardens during the summer. Community members and families also share in the stewardship tasks to ensure the gardens’ survival through hot summer months. The Toyota Evergreen Learning Grounds program provides schools funding and planning support for greening projects across Canada such as Bedford Park’s. The school received funding for the first time from the Learning Grounds program in 1993 ($400) and has since received two subsequent grants in 2001 ($500) and 2006-07 ($1,000). Ranleigh Rascals received funding in 2006-07 ($1,000). Support has come from landscape designers, Michael Hough and Arifa Hai, as well as Heidi Campbell, a school ground greening consultant with Evergreen. Donations and volunteered time from families and the community contributed additional on-the-ground support, key to the project’s success. Over the past 17 years the Toyota Evergreen Learning Grounds program has: motivated and supported schools in bringing nature to their school grounds; assisted teachers and schools in creating outdoor classrooms; developed a network of associates across Canada; provided hands-on help to schools to design and implement outdoor classrooms and gardens; supported teacher training; fostered positive government relations; offered intensive support to high-needs schools; created an award-winning Native Plant Database; developed focused initiatives to involve Toyota Dealers in local school greening projects. Toyota Canada Inc. (TCI) is the exclusive Canadian distributor of Toyota and Lexus cars, SUVs and trucks, and Toyota industrial equipment. TCI supports more than 300 Toyota, Lexus and Toyota Industrial Equipment dealers in Canada with services that include training, marketing and environmental and customer satisfaction initiatives. Toyota’s Canadian operations include automotive assembly plants in Cambridge, ON (Toyota Corolla, Toyota Matrix, Lexus RX350) and Woodstock, ON (Toyota RAV4), which together employ more than 5,700 Canadians. TCI’s head office is in Toronto, with regional offices in Vancouver, Calgary, Montreal and Halifax and parts distribution centres in Toronto and Vancouver. Toyota has a rich history of respect for people, continuous improvement (or kaizen) and giving in the communities where associates and customers live, work and play. It’s why Toyota Canada Inc. and its Dealers align with like-minded organizations like Evergreen. Since 2000, Toyota Canada has partnered with Evergreen in support of the Toyota Evergreen Learning Grounds program. Sandy Di Felice, Director, External Affairs, Toyota Canada Inc., planting herbs with (l. to r.) Erika Caldwell and Dushanna Daniels, members of Eco Kids Squad at Bedford Park Public School, on June 9, 2009.